One tornado touched down in Davie, while the others landed in Pompano Beach and northeast Miami-Dade, officials said. National Weather Service officials confirmed Wednesday morning that a third tornado, an EF-0, touched down in Davie Tuesday morning, along with the two previously confirmed EF-1 tornadoes, all of which downed trees and caused damage to homes and vehicles in Miami-Dade and Broward counties. The most recently confirmed tornado touched down in Davie with winds of approximately 80 miles per hour. Coordinates provided by NWS show the tornado starting at Weston Road and South Post Road in Weston before ending up at Nova Drive and Southwest 81st Avenue in Davie. Another tornado touched down in Pompano Beach, while another landed in northeast Miami-Dade, officials said. Residents of Miami-Dade said they woke up to the pounding storm on 191st Street, where trees were uprooted, power lines were downed and roof shingles were scattered on the ground. Miami-Dade Fire Rescue officials said a 37-unit apartment building at 1000 Northeast 191st Street sustained a partial roof collapse. All residents were evacuated and no injuries were reported. On Northeast 16th Street, the tornado was powerful enough to pull up some concrete. The storm likely caused a crash between at least three vehicles and a tractor-trailer on I-95 by Ives Dairy Road, officials said. 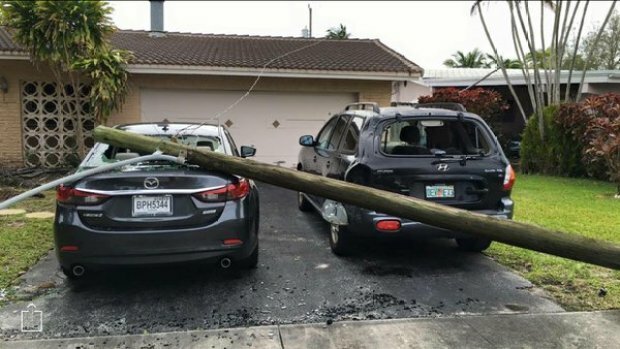 And in North Miami Beach, officials said the damage looked like the aftermath of a hurricane. "I'm driving around with our public works manager and this looks like the aftermath of a Wilma or Katrina, except with no notice," City Manager Anna Garcia said. A second tornado touched down in Pompano Beach, where more trees were found uprooted and an auto parts store had its roof taken off. One tornado touched down in Pompano Beach, while the other landed in northeast Miami-Dade, officials said. NBC 6's Marissa Bagg and Jamie Guirola report. "It took the roof off, rain, ceiling tiles, it's just a mess," said Ted Gerstenslager, manager of Murray's Speed and Custom. The tornado also ripped up the roof of the warehouse next door. A block away, a woman said she had to stay in her car while it passed. 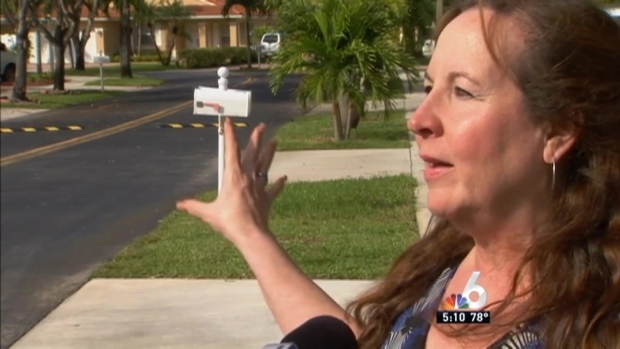 "I saw the things flying in circles, around, I started praying for my life," Carol Santana said. 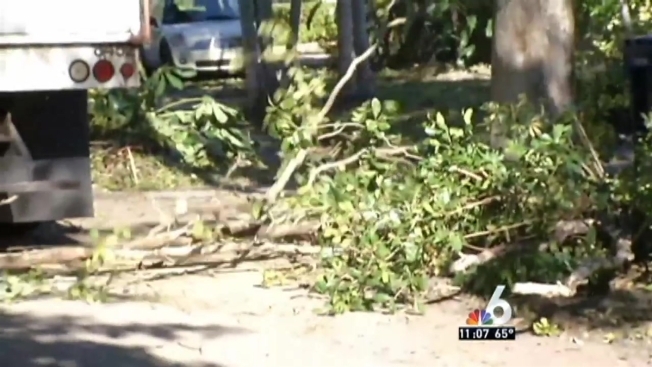 In Miramar, residents reported heavy winds at the Tequesta Cove neighborhood. Palm trees were ripped out of the ground and debris was scattered throughout the neighborhood. "I wasn't sure whether I should run back in or continue, I stopped and when I got to the corner I noticed all the falling trees by the gate," said Evelyn Ross. "It just sounded like a big freight train coming through," resident Burt Albalat said. "It was just pounding, I heard things falling, things bouncing off things, things hitting my windows." 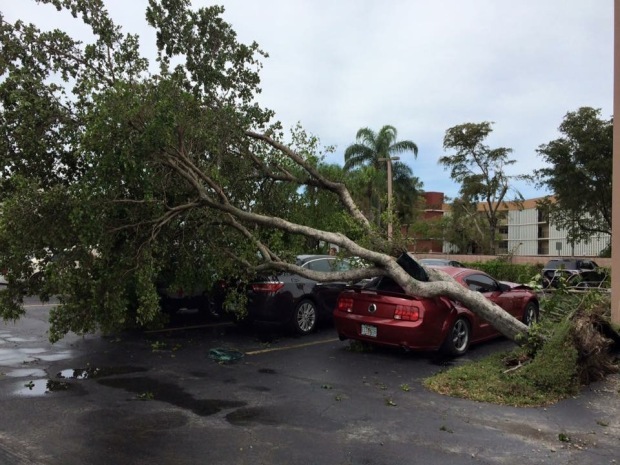 Severe storm damage in Miramar Tuesday morning. NBC 6's Marissa Bagg reports. In Fort Lauderdale, heavy winds sent beach chairs into the ocean and were responsible for overturning two boats, sending one person to the hospital.